Born on 17 July 1828 in Dublin, George Bernard O’Neill was the ninth of fifteen children in a middle-class family. His father, who was a clerk, cannot have found it easy to support such a large family on a modest salary; the children would have been sent to work as soon as they completed a minimal education at the local school. George Bernard O’Neill was living in London by the early 1840s, and studying art at the Royal Academy Schools. Although there is no extant documentation, it is reasonable to suggest that he either fled the potato famine of the mid-1840s or was sent away by his family for his own good—with the hope that he might be able to make a successful career elsewhere. 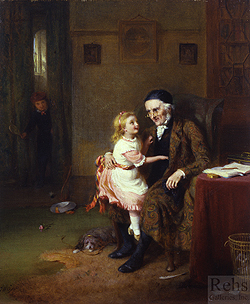 By 1847, at age 19, he was exhibiting regularly at the annual Royal Academy show, and beginning to attract attention for his skill as a portraitist and a painter of anecdotal genre scenes of contemporary life. O’Neill’s early career unfolded just as Queen Victoria and Prince Albert began to make a definitive mark on their era, one that would influence the visual arts as much as the geopolitical transformation of modern Europe. Britain’s industrial prowess—and colonial power—was in full bloom when Prince Albert devised a plan to host an international exposition showcasing the nation’s leadership in industrialization and design. The resulting Great Exhibition of the Works of Industry of all Nations, better known as the Crystal Palace Exposition—the first world’s fair—opened on May 1 in Kensington, London in 1851 to unprecedented fanfare, with visitors from all over the world in attendance. Prominent among the national displays were representative examples of painting and sculpture as well as the decorative arts. To his credit, Prince Albert acknowledged that Britain’s design skill did not compare favorably to other European nations; and as a result, he encouraged a new concentration on design schooling and art education for the British public. This proved to be fertile ground for numerous art societies as well as animated public discussions about the value of fine arts in developing British cultural literacy. For George O’Neill, this change of public consciousness could not have occurred at a better time. His career was about to take off. The Art Union of London, 444 West Strand, was established in 1836, and incorporated in 1845; has for its object the cultivation of a purer taste in matters of the fine arts, and their general advancement in the British empire, by the encouragement of native artists and an improved taste on the part of the public. The annual subscription is one guinea, and each subscriber receives for that amount a fine engraving of some first-class painting, and also the chance of a prize picture or sculpture, value from 101. to 2001., which is drawn for every April. There are upwards of 15,000 annual subscribers. The decade of the 1850s was equally momentous in O’Neill’s personal life. Not only did he meet and marry Emma Callcott, but he also became involved with the group of artists who would later become known as the Cranbrook Colony. The name comes from a small village in Kent, where Frederick Daniel Hardy, another genre and landscape painter, settled in 1854. Hardy’s decision to move to Cranbrook was based on both the availability of old houses and cottages for sale, and the presence of convenient railway access to London. In short, it offered a pleasant, often picturesque, site for painting, clear fresh air (in contrast to the unbearably polluted London), and easy connections to the art markets of the metropolis when necessary. Three years later, Thomas Webster joined Hardy in Cranbrook, sharing his studio at the High Street house. Within a short time, Hardy’s brother George also arrived, as did John Callcott Horsley, who was O’Neill’s friend as well as Emma Callcott O’Neill’s cousin. In addition, loyal Londoners George Henry Boughton and Augustus Mulready were frequent visitors, although they never purchased property there. As is evident, the relationships among this group were as much familial as aesthetic, but in general, they were all committed to the depiction of English country landscapes and genre scenes, often inspired by the imagery of seventeenth century Dutch and Flemish paintings. George and Emma O’Neill leased a timber-framed house in Cranbrook in 1860, and maintained it as a summer home and studio for many years. 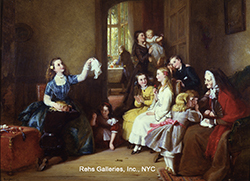 A quick survey of O’Neill’s paintings from the 1860s and 1870s illustrates how often he used this house as the setting for his work. In The Young Mother, for example, the central figure is silhouetted against an open doorway with a tiled roof and diamond-paned windows on the left. In the more complex composition, Testing the Harvest, people gather together on a bench beneath the same diamond-paned windows with the doorway now on the far right of the painting. As his colleague Thomas Hardy had recognized, Cranbrook was full of charming old houses that were ideally suited to the romantic genre images that the Cranbrook Colony painters found appealing. O’Neill also maintained a home and studio in London, where he spent the winter months. There he continued to paint portraits of professional men, such as the scientist, James Nasmyth, 1874, and to participate in the life of the metropolitan arts community. During the 1870s, he became friends with James McNeil Whistler, offering him moral support during the infamous 1878 libel lawsuit again John Ruskin. Although O’Neill’s paintings could not have been more different from Whistler’s chromatic abstractions, the two men shared the belief that the artist’s aesthetic purpose gave validity to a work of art. This also raises the question of whether O’Neill’s purpose in painting what appear to be sentimental images of children might not also have been intended as more serious social commentary. In a review of a 1977 exhibition on the Cranbrook Colony, Keith Roberts pointed out that O’Neill’s highly regarded Public Opinion, 1863, illustrated exactly this point. 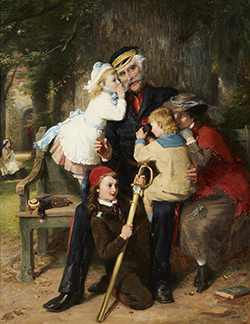 In this scene of avid art lovers peering at a painting at the Royal Academy exhibition, O’Neill implies that “to be popular a picture must appeal (and appeal instantly) to people of all ages and classes. 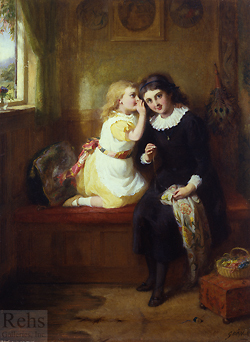 Above all, it must not bring a blush to the cheek of the young person.” [i] Roberts noted that children were frequently used as foils for social problems throughout British culture at the time, citing Charles Dickens’ use of “innocent children” in works as diverse as Bleak House, The Old Curiosity Shop and Oliver Twist. Who could argue about the abominable living and working conditions imposed by industrialization when the victim of this presumed progress was a rosy-cheeked child? O’Neill continued working at least into the early twentieth century, although he stopped exhibiting his paintings in 1893. His financial success was substantial by that time, and his reputation secure enough that clients sought out his paintings privately. He died in London on 23 September 1917, just two months into his 89th year. [i] Keith Roberts, “The Cranbrook Colony' at Wolverhampton,” The Burlington Magazine, Vol. 119, No. 888, Special Issue Devoted to Italian Painting of the Fourteenth and Fifteenth Centuries (March 1977), 207-214).